HomeAll PostsOur HeroesPolice Officer Gary Lee Michael, Jr.
Police Officer Gary Michael was shot and killed during a traffic stop in the area of East Green Street and North 2nd Street at approximately 10:45 pm. 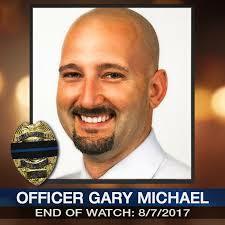 When Officer Michael stopped the vehicle for suspected registration violation, the driver exited the vehicle and opened fire with a rifle. Despite being mortally wounded, Officer Michael was able to return fire and wounded the subject. The man fled the scene in the vehicle then crashed two blocks away. The subject then fled on foot but was apprehended two days later. Officer Michael was a U.S Army veteran and had served with the Clinton Police Department for less than one year.